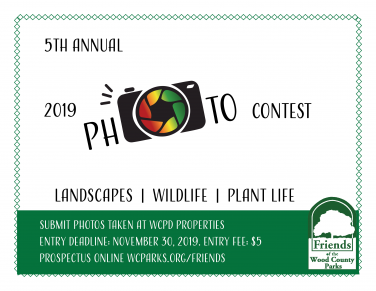 Photos taken at Wood County Park District properties in 2019 are eligible. There is a $5 entry fee to enter 5 photos. Friends of the Parks members can submit up to 10 photos for the $5 fee. The photography exhibit runs from April 6 – April 24, Monday through Friday from 9:00 am until 5:00 pm at the Four Corners Center, 130 South Main Street, Bowling Green, Ohio. Please join us at the Photo Exhibit Opening Reception on Friday, April 5th from 5:00 – 7:00 pm to meet the photographers, Friends members, and enjoy light refreshments. We would like to thank Main Street Photo of Bowling Green for their sponsorship of our Photo Contest. Commemorative Trail: A quality way to acknowledge milestones and loved ones. Legacy bricks are reasonably priced. Click here for a brick order form. 30th Annual Plant Sale! Click here for an order form for annual garden plants. Order annual garden plants by May 1st. 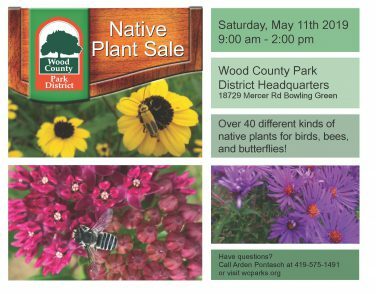 The Native Plant Sale is the same day as the annual flower pick-up on Saturday, May 11th, 2019 from 9:00 am – 2:00 pm. Birdseed, Bulb & Mums Sale is a pre-order fundraiser held annually each autumn. Donate today – every dollar helps the parks! Choose a category for your donation: Flora & Fauna, Bricks & Mortar, Education & Programs, and Endowment Fund. Thank you! Friends members who are 55 years and older are eligible to sign-up for the RSVP program. The RSVP program rewards you for volunteering with us! For a RSVP program application, click here. For a mileage/meal Reimbursement Form, click here. 18729 Mercer Road, Bowling Green, 43402. The RSVP program is a national grant-funded program with the National Service and Area Offices on Aging. To show support for the Parks. To help increase the Park’s visibility in the community. To assist in Park activities. To stimulate use of the Parks. To help promote the preservation of the natural park areas. To increase awareness of governmental legislation and administrative issues that affects the parks and increase awareness of environmental issues. A system of safe, well-managed parks reflecting the natural beauty and ecological diversity of Wood County will be an integral part of the lives of all Wood County citizens. Friends of the Parks of the Wood County Parks will engage the citizens of Wood County in ensuring the preservation of the natural beauty and diversity of the Wood County ecosystem by supporting the management and growth of the Wood County park system. Join The Friends of the Wood County Parks! Three newsletters each year updating you on the legislation and issues that affect our parks and informing you of various “Friends” and park activities. This is in addition to the Oak Leaf Program Guide from the Wood County Park District. Your membership dues provide funding for these services and volunteers provide the time, talent, and ideas to make the people-parks connection work!